Winter Orb has been an extremely popular skill in recent patches, and not without good reason. Not only is it relaxing and extremely straightforward to play, but it scales well and provides the player with great clear speed. In addition to the incredible damage, the skill is flexible enough to excel in a variety of different content types, like bossing, delving, and farming maps. Most Winter Orb builds are built around the obvious choice of Ascendancy; the Occultist, however, this one is a little different. Juggernaut is our pick of Ascendancy, due to its incredibly survivability and Physical damage reductions, greatly improving our ability to Delve deep. In addition to this, the Unstoppable node allows us to ignore the effects of Temporal Chains without employing curse immunity. This is critical to the build, and will be explained in more detail later in the guide. If you are looking to enjoy Winter Orb while it is solidly at the forefront of the meta, and in a new and interesting package, this is a great build to take out for a spin. Enemies will melt before you, and you will be flying through maps in a way that few other builds can rival. One of the core mechanics of this build is abusing the time-dilating effect of Temporal Chains to our advantage. A variety of other builds have abused this interaction in the past, so you may be familiar with the concept. If you are not, the essence of the idea is that Temporal Chains is used to extend a variety of buffs far longer than their natural duration. Shackles of the Wretched allows us to easily apply the curse to ourselves, Solstice Vigil helps to extend the buffs, and Soulthirst is employed to gain the Soul Eater effect. Through the use of the time-dilation from Temporal Chains, we can extend Soul Eater for long periods, allowing us to ramp up into a true Juggernaut of monstrous proportions and damage. For each stack of Soul Eater gained, the player gains 5% additional Attack and Cast speed. Not only does this cause Winter Orb to unleash an absolute deluge of projectiles, but it also makes our Leap Slam so fast that we can zip around the maps with ease. Winter Orb will automatically delete any enemies that you encounter, which will undoubtedly cause you to cackle with savage glee. Do to Soulthirst’s Unique effect, you can already deduce that Flasks are not a major part of this build. Since we need the longest flask effect possible, the Sanctified prefix is used on Mana flasks to achieve a running time of over 20 seconds — without Temporal Chains active. With the curse active, Soul Eater can run for well over a minute without interruption — as long as the Mana flask does not end prematurely. But how can we prevent this? Using the Mind Over Matter keystone combined with Death's Oath, we can easily ensure that we are taking a steady stream of damage and prevent our Mana from capping out. We also employ _Eldritch Battery, funding our skills without using Mana, and Energy Shield is unaffected by the damage from Death's Oath, as it is Chaos. What does this all mean? To sum it up, we use self-applied Temporal Chains to extend the length of the Soul Eater buff, which is procured from Soulthirst. Due to the extreme number of stacks we accrue from Soul Eater, our Winter Orb spits out projectiles at a dizzying pace, melting everything in sight and allowing you to move through the map as fast as you can aim your Leap Slam. This is the recommended Passive Skill Tree. Heart of Ice was recently buffed to include Energy Shield leech, which means a Watcher's Eye with the mod Energy Shield Gained for each Enemy Hit While Affected by Discipline is no longer necessary in order for the build to be fully effective. If you are using a Watcher’s Eye with this mod, you can unspec out of the Heart of Ice arm in that wheel and allocate the points elsewhere, should you choose. Winter Orb is the main skill in the build, and constitutes the majority of our damage and clearing, particularly when there are plenty of mobs present to feed our Soul Eater. For single target and applicable bosses, we also use Wave of Conviction, which can be cast ridiculously fast with Soul Eater active. Blade Vortex is also employed for some additional damage and a means of applying Temporal Chains via Curse On Hit Support and Shackles of the Wretched. Just like Soul Eater and other buffs, Blade Vortex will also last significantly longer than usual, minimizing the amount of upkeep necessary. Several auras can be run, since we require no Mana for our skill upkeep due to the use of Eldritch Battery. Vitality and Discipline provide additional Regeneration and Energy Shield, and Herald of Ice adds extra damage and the ability to create shatter-chains, which is invaluable given the amount of freezing we will be doing. Leap Slam is our main means of mobility, and is the perfect partner to the increased Attack Speed provided by Soul Eater. Another benefit of this skill is that it allows you to easily clear terrain impasses or ledges, which can be a huge increase to clear speed in a variety of tilesets. Immortal Call is used to make us permanently immune to Physical damage, as it will consume our Endurance charges, and have its duration extended by Temporal Chains. Since this build occasionally does too much damage or clears too quickly for Cast when Damage Taken Support to activate reliably, we can instead choose to socket Immortal Call in a weapon with the crafted affix Trigger a Socketed Spell When You Use a Skill, allowing it to activate autonomously as we clear through an area. Other skills, for example Storm Brand, can also be present in the same link and be auto-cast, merely for additional damage. Vaal Breach can be incorporated in an extra gem slot to feed additional Soul Eater stacks. Since we use Sceptres as weapons, this link will be in your Death's Oath. This must be socketed in Shackles of the Wretched in order for Temporal Chains to be correctly reflected onto your character. The fourth gem can be adjusted to suit whatever your playstyle or preference is. Physical to Lightning Support will increase the damage of your Blade Vortex by a decent amount and give you a chance of applying Shock, which is valuable. Curse On Hit Support should be upgrade to 20% Quality as soon as possible for added Curse Effect. Vaal Breach is not necessary but it feeds into the build extremely well. This should be socketed in a Sceptre with the Trigger a Socketed Spell When You Use a Skill crafted affix. The damage spells can be replaced as you see fit, however, these tend to work well with the Soul Eater buff due to the increased number of triggers that occur with Cast Speed bonus. This link provides us with a mobility skill and Endurance charges on-demand. The particular order in which you Ascend is not of vast importance, as you will not be able to play this build while leveling. Unbreakable is often a great first choice for Juggernaut builds due to the stability and feeling of invincibility it provides during the early leveling stages. In the end-game, the global damage reduction is not to be underestimated, and the Life Regeneration becomes all the more valuable as we continuously stack more and more Life. Unflinching is an node overall, providing organic Endurance Charge generation as well as a one-in-four chance to gain your maximum charges instantly. This is noteworthy once you start employing the auto-cast Immortal Call, as it allows us to frequently and reliably generate Endurance Charges without the need to constantly spam a skill like Enduring Cry. One thing to note, however, is that this node has great value even without the use of Immortal Call, and the Physical reduction while leveling is a great bonus. Unstoppable is the critical keystone that makes this entire build tick. Not being slowed below base movement speed is crucial to your clear speed, as we need to avoid the hindering effect of Temporal Chains without removing it via curse immunity and/or flasks. Movement speed bonus and immunity to stuns are merely icing on the cake. Unyielding grants damage and Area of Effect per Endurance Charge, and is really just the final piece in the puzzle for our Ascendancy. Once your build is properly online, this node really starts to sing, especially when you are moving through maps with utmost haste and constantly maintaining your Endurance Charges. Additionally, it is the only other Ascendancy keystone we can actually make use of: the Physical reduction from Unrelenting is worthless due to our permanent Immortal Call, as does the Accuracy bonuses from Undeniable. We do not gain anything useful from assisting any of the Bandit Lords, and therefore they should all be killed for the 2 Passive Points. Soul of Solaris a comparable choice, offering better defenses against lone targets, and should be fully upgraded. Soul of Garukhan can improve clear speed by a little when upgraded, but the reduction in Physical damage has no value. Death's Oath is the best option for our chest slot, as it provides us with the means to keep our Mana depleted via Mind Over Matter, thus allowing our Mana flask to continually tick and keep the effect of Soulthirst active. You will need to get a 5 off-color version (3 Blue, 2 Green, 1 Red), which is not difficult to create using the Vorici socketing technique, though it may cost a decent number of Jeweller's Orbs. *If you choose not to use Death's Oath for whatever reason, you will need to use Omeyocan and Shavronne's Revelation in order to keep your Mana from capping out. This frees up the chest slot, allowing you to use something that offers more damage, such as Inpulsa's Broken Heart, or whatever other Unique piece that you wish to incorporate into the build. 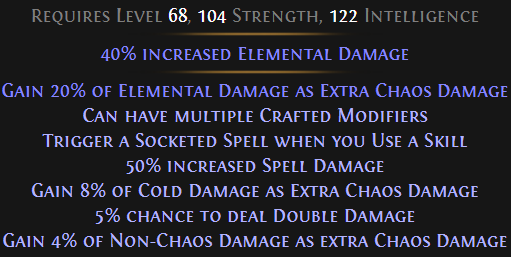 If you are investing for a good Shaped or Elder piece, try to get both of the Elemental/Physical Damage to Spells mods and craft whatever Resistance you need on afterwards. Shackles of the Wretched are used as our gloves and are absolutely necessary to make the build function at all. Cast Speed, Maximum Life, and +1 to Gems are all great corruptions to pick up later on. Weapons can be purchased or crafted, though we recommend crafting them, as they are relatively inexpensive to create (about 4-6 Exalted Orbs for both). While this may seem like a large sum for certain players, it is actually quite a cheap price in order to acquire a top-tier weapon for your build. Crafting is also necessary in order to have the Trigger a socketed skill when you use a skill affix, which is necessary for permanent Physical damage immunity via Immortal Call. The weapons should be Sceptres, and they must be Item Level 85 or higher and Shaped. Opal Sceptres and Void Sceptres are ideal due to their implicits, and the Sambar Sceptre is great too, but do not worry about the base too much. Roll the Sceptre until you get Tier 1 Gain % of Elemental Damage as Extra Chaos Damage (16-20%). This can only be obtained on Item Level 85+ weapons. Use a Regal Orb on the Sceptre. Use Orb of Annulments on the Sceptre until Gain % of Elemental Damage as Extra Chaos Damage is the only mod. 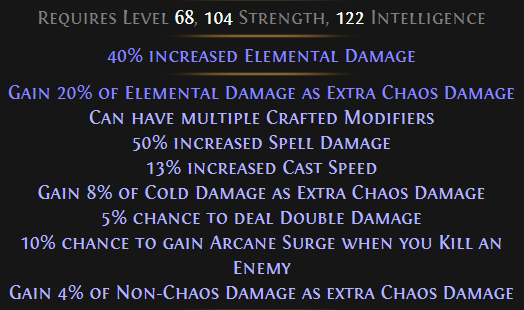 If/when you accidentally annul the Elemental as Chaos mod, repeat the process from Step 1. Head to the Crafting Bench and craft Can Have Multiple Crafted Modifiers on to your Sceptre. The Sceptres are basically complete now — all that’s left is to apply the correct Crafted mods. Using Sinvicta's Mettle in your weapon swap slot can also be a nice buff. Swapping to it for a single kill allows you start generating and “snapshot” the Rampage effect, which you can easily stack to maximum. Solstice Vigil is an essential piece of the build, but not absolutely required to get it off the ground. This amulet helps us further extend our buff durations via the buff Shaper’s Presence that it provides, which extends effects on you. This allows us to have the longest possible Soul Eater when combined with the Temporal Chains helmet enchantment. Call of the Brotherhood is a great and relatively inexpensive option to use, and can last you throughout the entire league. Since we do deal a significant amount of Lightning damage, converting it and scaling it through Cold is hugely beneficial, and the Shock application is fantastic. A Rare ring should also be used. 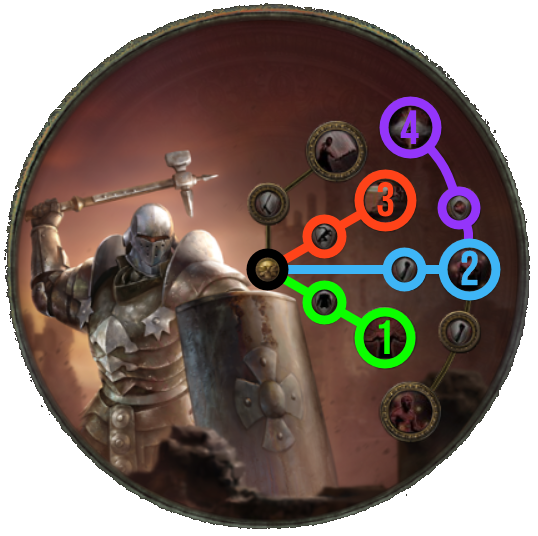 Nothing fancy is necessary; you should use your Ring to help fill out Resistances and get as much Dexterity as possible. If Call of the Brotherhood can not be obtained, simply use two Rares. Soulthirst is our belt of choice, and absolutely mandatory to procure Soul Eater, the buff that the entire build revolves around. It is traditionally very cheap and easy to obtain. The most important mod is the first one, as our Energy Shield is our Mana due to the Eldritch Battery keystone. Even with the Energy Shield leech we acquire in the tree, this affix still makes the build feel quite a bit smoother and more secure, and it is worth acquiring it even if that is the only useful affix you can get. The other listed affixes are more for luxury when you are sitting on a mountain of currency with nothing to spend it on. Inspired Learning should be acquired when your other core items have been obtained, and placed in the socket above the Witch starting area. Rare Jewels can be itemized in whatever way you please, but ensure that they have health. If you are lacking Resistances, this can be a good place to fill them out early on, as they are less expensive that damage itemized Jewels. Any other useful mods you can afford until you can upgrade work perfectly fine. You should use one Abyss Jewel with the % Chance to Gain Onslaught on Kill affix, as this also increase clear speed noticeably and the buff is extended by your Temporal Chains. Since using a Flask cancels our Soulthirst’s Unique effect, the Soul Eater buff, no Unique or expensive flasks are utilized in this build. Using multiple flasks of the same type and duration allows you to benefit from all their suffixes, hence why we are using 3 Mana flasks. Under no circumstances should you run any flask with the of Warding suffix. You will not actually use the Life Flask or the Quicksilver regularly. The Life Flask functions as a last resort panic button, while the Quicksilver is helpful when you enter the map, or if your Mana caps out from an Inspired Learning effect that generates Mana. There is no possibility of leveling with this build. Since the entire concept revolves around ripping apart maps with good density in the end-game, and abusing the interactions between end-game Unique items, you will have no choice but to level the character using either a different build or a different skill. It is not recommended to level using Winter Orb as the damage is relatively low without scaling effects, and there is not a lot of damage nodes early in our tree. The best method is to simply level as another build entirely that has a somewhat similar tree layout, allowing you to easily and cheaply respec later on. Static Strike and Cleave are both passable options to get you through the Acts if you want to play a melee build. There are a number of really cheap and powerful 2-Handed Unique weapons that will assist in this process, allowing you to smash content. Herald of Agony with Rain of Arrows can also be used with Quill Rain, as it deals fair damage without many damage nodes, and can function on a 4-Link. With melee buffs promised in the upcoming League (Patch 3.7.0), leveling will most likely be favorable with a melee skill. How Do I Get Started in a Map? When you enter a map, stack your Blade Vortex up to 10 and run into the first pack. Temporal Chains will be reflected on to you. Activate your Mana Flask(s) to procure Soul Eater from Soulthirst, and you are set to start ripping apart the area with Winter Orb. If you are using Sinvicta's Mettle, you should also swap to it for one of the early kills to stack Rampage. Carefully consider the map layout and approximate density, as you will be forced to reset your Soul Eater at least once in most maps. If you are approaching an area with great density and your Mana Flask(s) have less than 20-25 seconds remaining, it might be a good idea to “tactically reset” early so that you have the maximum number of stacks for the boss. This is more of a “feel” thing than a hard rule — play around with the build to get a better instinct for this. This is Interesting, but Why Not Occultist? The sheer clear speed, defense, and possibility this provides put it far ahead of nearly every build in the current meta for clear speed. While Winter Orb will almost certainly be nerfed in the future, this build is your chance to experience it at its most overpowered, map destroying, boss melting state. Why Do I Need the Helm Enchant / Curse Notables? Increasing the effect of Temporal Chains on ourselves further increases the time-dilating effect, which allows buffs to last longer. This makes maps feel smoother and allows us to have longer and more powerful Soul Eater sprees. 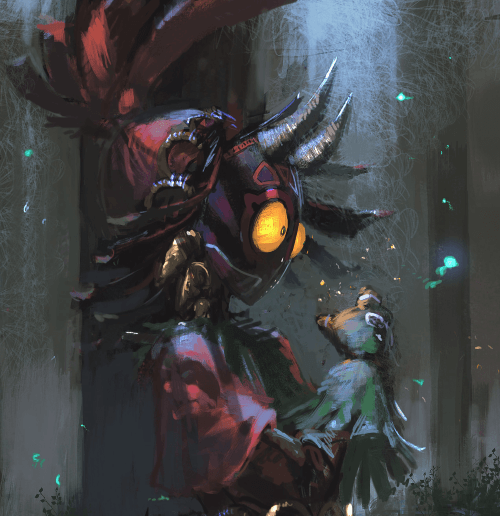 45% Curse Effectiveness is necessary along with Solstice Vigil in order to reach the absolute maximum duration of buffs; you will naturally have this number if you follow the build recommendations and acquire the Helmet Enchantment. Wow, This Is a Lot of Information! If you are confused about anything, please do not hesitate to leave a comment on the build and I will be happy to clarify any confusion you have! This build has a lot of interlocking and complex mechanics. 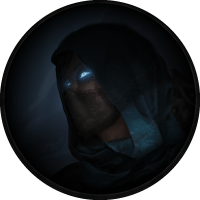 22 Apr 2019 Added a new FAQ section regarding Winter Orb and Ascendancy choice, added About the Author, and updated leveling section. 16 Apr 2019 Build added. I have just got to the epilogue and farmed the mandatory items with other character and I’m not able to make it work. When I cast blade vortex and get near the first pack, drink the mana flask and cast winter orb my life just starts to go down by itself, without any enemy focusing me. Does anybody know the answer?